Risky stuff, but powerful if you have the courage! Publisher's blurb: "The Cults of Law have been trying to stamp out the Cults of Chaos for an age. During this time of intense conflict, many a good book has been burned out of existence; lost forever to the fires of Law. Herein lays the manuscript for one such book, thought to be lost, yet somehow, during an investigation of its contents, the magicks within were exposed to the world. 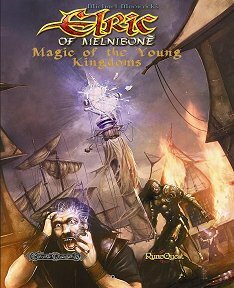 "Magic of the Young Kingdoms contains a wealth of information, not just for those allied with Chaos. Within you will find new runes, along with advice on how to use them effectively. Summoning spells, the likes of which have not been seen before, shall allow you to conjure the most fearsome demons to work for you or with you. "Included are step by step guides to the Elemental Paths, along with in depth descriptions and last known locations of ancient texts, filled with magical secrets far beyond even the most experienced sorcerer's imagination. "The dark art of necromancy is described at length, with extensive advice to guide you through the process and keep you safe from the dangerous pitfalls that are ever present within this discipline. There is also an extensive guide to the dream worlds and their safe navigation, as one wrong move or wrong thought, could leave you stranded there forever. "The magicks contained within this book are not for the faint of heart or the weak of mind. They are powerful and dangerous, never to be taken lightly. So to the brave, the strong and possibly the crazy, take up this powerful book and see the extent of where it can lead you."